It is some years since I was introduced to a particular writing frame structure, developed by a group called the AstraZeneca Science Teaching Trust, supported I think by Hampshire CC and by the University of Southampton, (for details see http://www.pstt.org.uk/ext/cpd/the-thinking-frames-approach/getting-started/introducing-the-levels-mountain.html). It was specifically designed to help students (KS2 or KS3) write longer accounts of science observations, and to reach higher National Curriculum levels of comprehension, modelling and analysis. I have used it with older students too. An example will make it easier to explain, and I should say, this is how I have modified the original model over the years. First activity is to show students an event with a surprising and/or dramatic outcome. My example today is the flying teabag experiment, there is a video for those who are not familiar with this simple demonstration. I think the method could be useful in subjects other than science, but I’ll stick with one I know well to begin with. Students watch (or perform) the activity, and then draw three (cartoon) pictures to summarise the sequence of events. While they are drawing I collect vocabulary they might use to describe or explain what they have seen, and write it on the IWB. Usually every member of the class can be asked to contribute at least one word. Then the students use the words to label their diagrams (I usually set a minimum requirement). If students offer extra vocabulary I add it to the board. I ask the students to write sentences, first to describe what they saw happen, then to explain. I challenge individuals to add explanations at greater levels of complexity (in terms of the movement of particles/air molecules, explaining how the density equation is relevant, linking to ideas of forces and flotation). The final task is to change their sentences into a logical paragraph, this is often an out of lesson assignment. Assessment for learning is built into the activity, as teacher I can applaud what is achieved while specifying what is needed to improve. As it is, this is an engaging lesson that results in real learning. How to develop it with the resources we now have in the classroom? First the vocabulary list on the IWB can be sent as a PDF to class members. I find that many ask permission to photograph it anyway. All our students now have iPads, so they can video experiments. 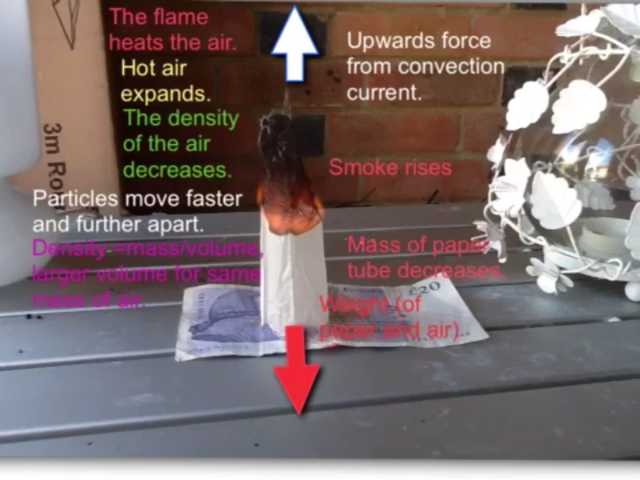 As on the video I have posted on Vimeo (link below) students can use Explain Everything to add labels, still photographs and commentary. The commentary could replace the final paragraph or be an addition. My plan in the coming year is to have students collate all their digital work in an ebook. So they will be able to add the completed video, and the feedback it receives, as they build the ebook in CBB. Differentiation is built into the process, whether we use NC levels as in the original scheme, or other criteria. Individuals can be challenged to more critical thinking, and employment of more sophisticated concepts during the ‘writing sentences’ stage and in afL. Whether students draw cartoons or edit their own videos their is plenty of scope for creativity. As the exercise stands the collaborative process is in the classroom. Communication skills are enhanced as students are encouraged to use correct technical vocabulary and to create complete sentences and longer passages. Here is the Vimeo link: (here is the URL if the link fails https://vimeo.com/100989384). Other Physics activities that would be suitable: candle under balloon half-ful of water, sparkler on electric drill, bromine diffusion in air and into vacuum, candle floating at oil/water interface, raisins in sparkling water ‘lava lamp’. Revision lessons – how to ensure that it’s the students doing the work? How to ensure they are revising effectively? And, in this century, how to involve the four C’s (collaboration, communication, critical thinking and creativity)? Here is an activity that I adapted a few years ago from a suggestion made by a colleague. It is probably more suitable for subjects with more fact content such as my specialism (Physics) but I leave that decision to you. Take a topic, or unit of work and cut it up into statements. For older students the exam board specification or a list from the teaching scheme may be fine.. Younger or less academic students will need such statements to be chunked and/or rewritten. Set up a document with a three column table: Give the columns titles: statement, question, answer. You may wish to number the statements. Copy the statements into the first column. It is the students’ task to invent questions (and supply answers) for each statement. If it is a preparation task I usually set each student a different bank of statements to prepare questions for. If they meet the list at the start of a lesson, students collaborate in pairs for 10 minutes or so to devise, say, 3 questions each pair (again, I allocate these so that the list is covered). Then one of each pair stands and moves along to the neighbouring desk. My classes are used to (have become resigned to) these circulation patterns. The students take turns to ask their new partner their questions. If they meet a question they can’t answer the student must write down the question and answer, questioners learn to refine their questions as they pose them to other students. If students do not agree on an answer they ask me to arbitrate. Every 3 minutes or so, the same students move along again to a different partner, with different questions. Plenary activities can be mini-whiteboard, Socrative, or other tests, votes (again can be with Socrative) for most difficult statement, or things that need explaining next lesson. Students have worked collaboratively, they have criticised unclear questions and unsatisfactory answers, they have created Q and As, and a great deal of on task communication goes on. The task may be pencil and paper or completed digitally. Students are required to engage with the material when devising questions, not just parrot it. Students learn a revision technique to take and use elsewhere. First comes an injection of knowledge of some new digital technique or device. Comprehension leads me to use my pedagogical knowledge, and apply the technique to help teach some content for which I think it may be appropriate. 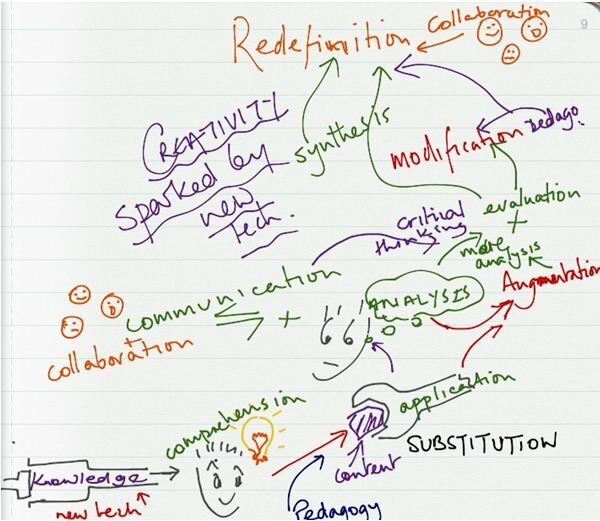 I’ve invoked TPACK concepts (see below), but I’ll also concede that at this stage I am probably only substituting a digital technique for a previous method (SAMR, notes on this below too). Reflection and analysis, with some communication and collaboration (from students or colleagues) will hopefully lead to Augmentation, so that the results of using the new tool are better than those with previous teaching methods. More collaboration and communication, combined with critical thinking and evaluation should lead to Modification of the original task. Leading to the peak of Bloom’s taxonomy where all the previous inputs are synthesised and in a burst of creativity the original task is redefined and re-imagined to produce results that were impossible to achieve previously. A practical example: For some years I’ve encouraged students to photograph experimental set ups to help them remember and record what they have done (substitution for traditional science diagrams). Students moved on to analysing their photgraphs to make more precise measurements than they could in the course of the experiment (Augmentation). 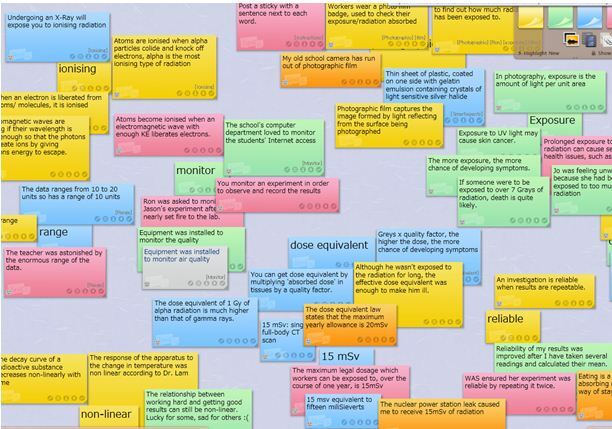 Then students chose to video experiments so that they could analyse transient phenomena (Modification), and then by employing apps such as SloPro they realised they could plan and carry out investigations that they had not considered possible before. I’ll save other examples for future blogs – here are some notes on the acronyms in the title. SAMR was devised by Ruben Puentedura as a way of describing adoption of digital technology. At first Substitution, then Augmentation, followed by Modification of the task and finally Redefinition with creation of new tasks. I usually think re-imagination here. TPACK – a Venn diagram of technology, pedagogy and subject content knowledge, the best learning and teaching happens where the three circles intersect. And the four Cs – collaboration, communication, critical thinking and creativity – which need some Content, I think, to be valuable. For Bloom’s taxonomy – I refer you to Steve Wheeler’s two blogs! A less academic set, last period Friday afternoon, a lesson of helping them understand how to solve electric circuit problems – how to engage them, give them some success at the end of the lesson and even better consolidate some ideas? Students sit (in silence, which either feels wonderful or creepy) in groups of four or so per table, and deal the cards face up, so everyone in the group can see all the cards. Their aim is to arrange the cards into sentences. At the end each person should have some complete sentences in front of them. The difficulty is players can only give, not take. The cards – About 8 sentences, each sentence chopped into 3 parts. So cards either start with a capital letter (first in sentence), end with a full stop (last in sentence) or neither (middle card). There is an example set at the bottom of the blog. The exit ticket – the group has completed the sentences, each person has a photograph of the complete set. Students collaborate, there’s competition, and once you’ve made the cards you have a resource to re-use in following years – just be careful to bag up each set separately. Electric current in wires is / a flow of / electrons. A series circuit has only one / path from positive / to negative. Components connected in / parallel can be switched on	/ and off separately. Connect the voltmeter last and / in parallel / with a component. Ammeters are connected	/ in series and measure	/ electric current. Resistance is measured in / ohms, work it out by / voltage divided by current. P.D. stands for potential / difference and is measured	/ in volts. A diode only / allows current to flow	/ in one direction. I have been experimenting with lino, a free web based tool for creating and sharing notice boards. You can create an account at (linoit.com) or there is an app, but going through a browser avoids the scrolling advert. I thought it might be a useful way to help students to work co-operatively, and discovered some dos and don’ts that might help other teachers. My first problem is probably particular to my college – I discovered that the app was blocked so that the students couldn’t upload it to their (college) iPads, and that the sign-in page on Safari was faulty. So with my first class of 14-year-olds I had to revise my plans quickly and I invited them all to contribute to one public board. It turned out that many of them thought Shrek had some good ideas about comparing light bulbs. So we celebrated their success in posting, moved on, and their (extra) evening task was to open an account for themselves. They did this successfully, and used the web links and tasks I had put on the first board to start their research in the next lesson. (The students chose who to work with and spent 30 minutes composing a board). I gave them some feedback and pointers for improvement , as you can see on the yellow stickie. The class then had a full Evening School assignment to complete the work. My big criticism is that there is a great deal of cut and paste without attribution. Although the task increased co-operation and gave students an opportunity to backed previous experimental work with exemplars from the real world, little critical thought went on. I included one structured question to answer, I realise I should have put in more demanding, higher level tasks like this, as well as the ‘contents list’ that they started with, in order to encourage higher level thinking. The next board was a response to a different task. The Advancing Physics course has a pre-release paper. I chose words from the first paragraph and asked students to compose sentences to show they understood the meaning in the context. After 15 minutes of composition, I sent students the link to the board, with the words on it, and asked them to post their sentences. We could then add corrections and comments on the SmartBoard to think about whether the sentences used the word correctly, and if they made its meaning clear. I have a large number of ESL students in some classes, and all the students were involved in critical thinking, as they judged the sentences. What next? Students from other classes can be permitted to look at boards – maybe without permission to post notes. I’ll print the best boards for the notice board outside the classroom. Students have been collaborating while physically in different houses, perhaps we can spread that further? During the Easter break I have been reading Thinking, Fast and Slow, by Daniel Kahneman. Kahneman won the Nobel Prize for Economics in 2002, this (2011) book describes how (in his view) cognitive and social psychology explains how we think and make decisions; and why we so often ignore statistics and probability, even when we know the facts. Kahneman writes engagingly and convincingly. When he describes a choice, and explains how and why most people make the wrong choice, my first instinct is usually that wrong, popular option. Kahneman explains this by invoking two systems (1 and 2). System 1 is the default, the before you blink choice, the intuitive feeling, the conditioned response. System 2 is a choice to think rationally, to consider all the facts, draw the probability tree, calculate the percentages, weigh the relevant evidence, and discard the coincidental occasional correlation or plausible explanation unless there is theory and fact to support it. Kahneman describes system 2 as lazy, it doesn’t start to work unless we prod it into action. In an early chapter he gives a simple example, which I shall anglicise. You are in a café, and want to buy a scone. This is the sort of café where the pat of butter or spread is charged separately from the scone (I know, next time go somewhere nicer or buy a biscuit). The total is £1.10p. The scone costs £1.00 more than the butter. How much was the butter? Okay, maybe you have resisted the temptation to say 10p. I’ve tried it on several people, only one thought it through and realised that would be wrong – and she acknowledged the temptation as she thought aloud and said,’ I know it’s not going to be 10p.’ Then took a while to calculate 5p. System 1 clicks in as we first read £1.10p and we have to make a conscious decision to think the question through more carefully. What has this to do with exam. prep.? My plan is to ask a class (with mini white boards) this question. Then, after the students’ response, to talk about ways they can force themselves to read an examination question carefully, using highlighters, arrows and underlining. The aim being to engage a lazy system 2, to think rationally and explore an idea thoroughly so they can demonstrate their academic ability. I hope if I share this insight from Professor Kahnemann with my students, it will convince some of them that there is a reason for the advice I give them about examination technique. Before I had an IWB I had no idea of how useful it could be, and how it could help teaching and learning in my classroom. Learning what was possible was the key to seeing what could be useful, so I thought others might like to share in what I now use most often. The IWB in my classroom is a ‘SmartBoard’, but I have used other types so most of what I shall write will apply to other makes. You will notice the tool bar is on the bottom, I put it there because the board is on the wall behind my desk, so the bottom of the screen is often obscured from students’ view. At least they are not missing lesson content that way. Just like a touch screen on laptop or tablet, you can swipe to move from page to page. I usually find it more useful to be facing the class at transition moments, so I normally use the keyboard on my desktop, or the remote. However I am a slow typist, so I do prefer to write on the board, choosing the pen tool gives the calligraphy option. This makes a dramatic improvement to my handwriting, not only can the students read what I’ve written, text recognition (select text, choose dropdown menu top right of box) works too. I still tend to prepare work as PowerPoint slides, not all the machines I use have SmartBoard software. I can add to the slides as I show them on the IWB. 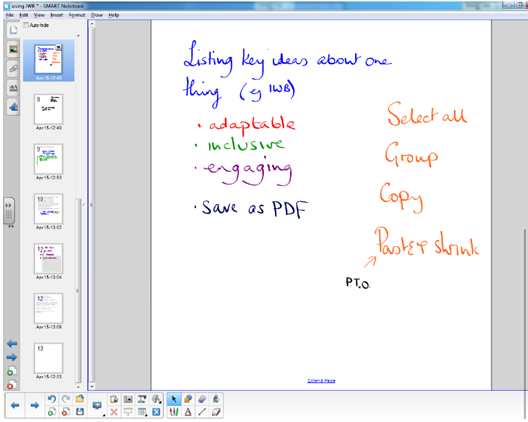 if I use the computer mouse to hover over the bottom left corner, and select the pen icon that then appears by tapping on the IWB with a pen I can later choose to save or discard the annotations. But some prepared IWB files do help to make activities student centred. Put a diagram/photo/map in the centre of the board, with unattributed label words around it. Students can drag the words into place, or add arrows. If I hand write each word in a different colour, there’s no danger of two words being grouped together. Let students sort words into columns (factors affecting thinking or braking distance) or Venn diagrams (KE, momentum or both). Paste exam questions, and either model or have students attempt their answers. Paste text and ask students to highlight key words e.g. those showing a particular character trait. These last examples remind me to talk about more of the tools I find particularly useful. If you choose the camera icon, then switch to a different programme, you can snapshot pictures or text. (Don’t forget to give credit). The pen tool has the option of a highlighter. The blind is useful to conceal then reveal (e.g. model answers). The creative pens help with highlighting important points, but I’m sill looking for a good excuse to use the magic pen that spotlights whatever you circle. A brilliant short cut with the ‘eraser/board cleaner’ is to draw a circle with it and then tap the centre – everything within the circle is wiped. There are more drawing tools, and word processing tools, there are galleries of activities and objects, and the ability to record a presentation with voice. Although I’ve tried them, they haven’t been so useful in the context of my teaching. But two particular actions have been transformational. in a physics lesson I often want to develop quite a long argument, referring back to previous lines and diagrams. The IWB has a smaller area than many traditional teaching boards. You can keep writing, but it gets long, thin, and the bit you are talking about to the students is on the bottom, less visible part of the board. So duplicate the present slide/page as you fill it, select all, draw, group, then shrink it into the top left corner. It will still be legible, and is there for reference as you develop the argument. The other action? As well as filing, under ‘file’ is the option to ‘send as PDF’. At the end of the lesson I can email any student who has missed the class with the notes from that day. This has been a very quick snapshot overview, to try to demonstrate that an IWB is so much more than just a projector screen. My mind is crowded with other ways to increase student involvement and engagement – I’ll save some for another post.